괘불이란 절에서 큰 법회나 의식을 행하기 위해 법당 앞뜰에 걸어놓고 예배를 드리는 대형 불교그림을 말하는데, 만연사괘불탱은 중앙에 석가불과 좌우에 문수·보현보살을 배치한 석가삼존불 형식이다. 만연사에 있는 이 괘불의 크기는 길이 821cm, 폭 624cm로, 중앙의 본존불을 중심으로 왼쪽에는 여의를 든 문수보살, 오른쪽에는 연꽃 줄기를 든 보현보살이 서 있다. 삼존의 크기가 서로 같지만 본존불은 신체에 비해 얼굴이 크고 문수·보현보살은 얼굴이 작아 늘씬하다. 용·당초·파도 등의 문양과 구슬장식이 화려한 이 괘불탱은, 특히 보살의 하의에 마치 청화백자 문양처럼 흰 바탕에 청색안료로 대나무·죽순·소나무·기암괴석 등을 묘사하고 있어 특징적이다. 그림 아랫부분에 있는 기록에 의하면, 조선 정조 7년(1793)에 금어 비현과 편수 쾌윤·도옥 등 3명이 그렸음을 알 수 있다. 비록 다른 괘불들에 비하여 조성연대가 떨어지는 18세기 말 조성의 작품이기는 하지만, 전통적인 면을 고수하면서 화려한 문양과 짙은 채색·유려한 필선 등에서 독보적인 경지가 엿보이고 있어 주목되는 작품으로 평가된다. This type of large-sized painting used to be hung in the front courtyard of a temple hall at an open-air sermon session or ritual. This triad shows Shakyamuni Buddha at the center flanked by Manjusri Bodhisattva holding a magic bead and Samantadhadra Bodhisattva holding a lotus twig. It measures 821cm (L) by 624cm (W). The main Buddha’s face is large compared to the entire body. 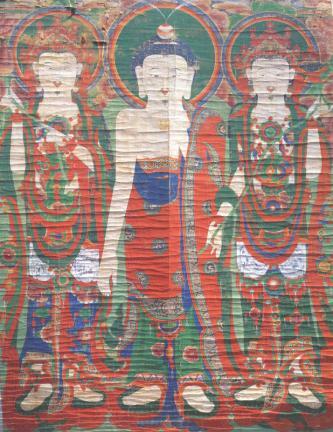 The images of the Buddha and the bodhisattvas are of similar sizes. The piece features the patterns of dragons, scrolling vines, ocean waves, and flamboyant bead accessories. The lower part of the robes worn by the bodhisattvas contains images of bamboo shoots, pine trees, and bizarre-looking rocks like those on the surface of blue-and-white porcelain. The remarks at the bottom of the piece say that it was painted by three monk painters -- Bihyeon, Gwaeyun, and Dook -- in 1793 (the 7th year of King Jeongjo’s reign). Made later than many other large-sized hanging paintings, it keeps the tradition of large-sized hanging paintings but displays unique aspects in terms of gorgeous patterns, deep colors, and skillful brush strokes.